Hello. Happy Saturday. Are the days until Christmas ticking off too fast for you, me too. So much to do, so little time. Today's card is for the Midnight Madness Sketch Challenge (MMSC32) www.priscillastyles.blogspot.com . Fun Sketch to work with. And I was tired of the traditional colors of Christmas so I decided to go soft with this card. 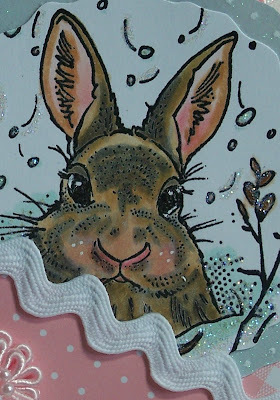 This adorable snow bunny is a stamp from Onyx Xpressions. The rubber on their stamps is black! The papers are from Martha Stewart. Used Kaiser pearls and rickrack trim. Large snowflake was cut in half, then glued to the card. Pink ribbon embellishments are Offray. On the inside the sentiment is "All nature whispers the miracle of Christmas"
Thanks for stopping by. Hope you're able to relax and enjoy some quiet time (fat chance). Sue, I absolute am in love with this card. It is just so sweet and precious as can be. I love what you did with the snowflake and those little pink flowers are priceless. What a fun and wonderful card!!! I would like to take this opportunity to thank you for all your support throughout the year for Midnight Madness and wish you and your family a very Merry Christmas and Happy New Year. This is so beautiful...I love the softness of the pink and those Offray ribbons are awesome. Great coloring of that cute snow bunny too! Awwww, that is so sweet!! Me lubs bunnyfoofoos and I was wondering what would happen to the little bunny family outside my apartment complex, this answers all of my questions!! Gorgeous work, love the glitter!! Ohhhh Wowww Sue,what a beautiful card,i love your image and colours. PRECIOUS!! This is just the most darling little bunny!! I am a bunny/pink lover!! Love you embellishments!! Beautifully done!! Thanks you very much for playing with the MMDesign Team this week. Love this card and those flowers are fabulous. Hey, Sue! I love this! The precious rabbit, flowers, pearls and pink gingham are fabulous! that is one of the sweetest cards I have ever seen! Love it! Wow, you never disappoint do you? I think this bunny is so dang cute. 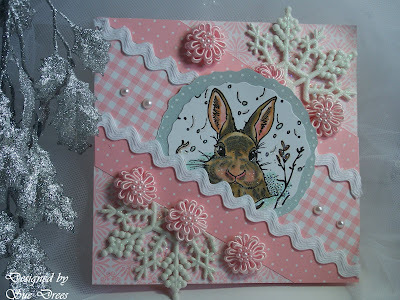 It is the perfect snow bunny :) Your colors are so fresh and lovely and of course your take on the sketch exceptional :) Thank you so much for playing the Midnight Madness sketch Challenge this week. I know it will get busy in the next week or so, so I would like to take this opportunity to wish you and your family a Merry Christmas. This is absolutely darling Sue!! I love everything about it from the flowers to the pink gingham and dp patterns, to the snowflake to the sweet image. Divine take on the sketch!! colors and all of your lovely embellishments that make this so feminine. Great take on the sketch challenge. Thanks so much for joining us this week at MMSC! What a wonderful card. I like ist very much. And these colours. Great. This card is just darling!!!! So sweet!